I’m currently reading HUNTING PRINCE DRACULA, the sequel to STALKING JACK THE RIPPER by Kerri Maniscalco and loving it! I’m not really a big historical fiction person but I have found that I’ve been loving historical fiction with a twist of its own. Whether it’s the addition of magic, a brand-new mystery, or an alternate timeline, historical fiction with a twist has really been grabbing me lately and I’m loving the intrigue of true life meets fiction! Why: Audrey Rose is all thorns and roses, feminine and yet tough, and she starts on the Jack the Ripper murders while apprenticing for her uncle as a forensics student. Why: Imperial Russia takes a twist with the introduction of a history of magic. A battle to the death arises as two enchanters fight to become the right-hand magician of the Tsar of Russia. Why: Historical fiction meets magic again, this time with more witchy involvement in our past. An alt-history take on the Salem Witch Trials. Are these books good on audio? I desperately need to finish this series! Why: Grave Mercy is some serious historical fiction complete with wars, tactics, and actual historical figures. There’s a lot of history in these books but I didn’t feel bogged down with facts and data. The story was fantastic, plus, assassin nuns. Nice mythology twist to bring a dark and mystical side. Why: I actually wasn’t the biggest fan of this book because for as much as it was advertised as historical fantasy, there wasn’t a whole lot of magic in this first book, BUT I did love that it focused on a time/place that isn’t often covered — the Gold Rush. That’s my fast five for today! Do you have any other favorite historical fiction novels with a good twist to them? I’m totally in the mood for these right now and always up for more! This entry was posted in Books, Fast Five Friday and tagged Book Recs, Books, Fast Five Friday, Recommendation, Recommendations, Witches & Wizards on May 5, 2017 by Brittany. Publishing Info: July 21, 2007 by Scholastic Inc.
Ahhhh, at last, my Harry Potter re-read is finally over! 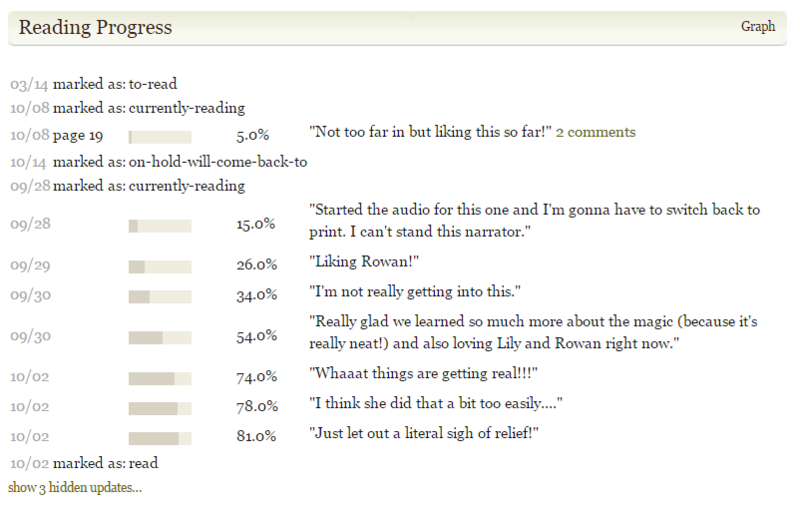 I started back in September 2013 when I decided that I wanted to re-read the entire series via audiobook and a year and a half later, that re-read has come to a close! The experience was absolutely delightful and so much fun to experience both through a different format and much later on in my life. HARRY POTTER AND THE DEATHLY HALLOWS has always been the big question mark book in the series as far as how I would rank it. I had a clear favorite and I had clear least favorites (I love them all, but you know) but DEATHLY HALLOWS was just such a DIFFERENT book than the rest and that made it hard to place. There’s barely any time at Hogwarts (until the Battle of Hogwarts — ohhhh let’s not go there yet), no Quidditch, and a whole lot more focus on, well… the END. The books grow darker over time but this is definitely the one with the most hardships, evil, and battles but it also has a incredible amount of bravery and victory. I’m still finding it hard to place this book in a line-up but I will say that this was the book out of the series that really evoked the most feeling from me as I was listening. Of course, there are some MAJOR losses as far as favorite characters go and even though I knew they were coming, it didn’t soften the blow any less. In fact, no matter how much I missed Sirius and Dumbledore, their deaths in the previous books didn’t really tug on my heartstrings for whatever reason… and they really do make up some of my favorite characters! But when I was listening and realized that this was the last time we’d see and hear Lupin and Fred alive… GAH. Then once we had to see them after they’d been lost in battle. MY HEART. I think maybe because I made more of personal connection with those characters along the way. Sirius was Harry’s godfather but I always felt like Lupin was more of a father-figure. And it just pains to me lose Fred because the Weasley twins are some of my absolute favorites. Besides the obvious deaths though, I really finally connected with so many of the characters. I’m not a Harry/Ginny shipper but I really understood their connection a bit more in this book. I felt love between friends and love amongst families. I think everything just really stepped up a notch in this book and actually, I feel like J.K. could have really dug into those moments a bit more to wrench some more emotion out of it but… that could also not impact me as much from so many re-reads! I’m actually excited to start this process all over again. I’d definitely like to re-read this series every couple of years or so. Maybe next go around I’ll switch back to print! But I will say that there’s definitely a reason why we’re all so in love with Harry Potter. There’s some real magic in there besides what Harry can do with a wand. This series is utterly captivating and from childhood to adulthood, I will always hold the Harry Potter series in my heart. Severus Snape // Character Obsessions: Lily, suppressing emotions. I really REALLY love Snape’s connection with Lily — and it’s the most amazing to look back on the whole series and see HOW MUCH that impacted EVERYTHING. I think the book definitely does a better job of bringing out that friendship and exactly how much Snape cared for Lily. There’s an extra scene that the movie cut out where Snape and Lily are teenagers — later on in their Hogwarts years — and maybe because I’m a YA reader? I’m not sure, but I felt like that was a REALLY important moment of their friendship. They weren’t just two eleven or twelve-year-olds who were friends because they lived near each other and they were both capable of magic. Despite their different tastes, different upbringings, different groups, they were still best friends. I think that really reminded me exactly how strong that relationship was so it made everything MUCH more powerful. Snape and Lily weren’t just classmates. They used to be best friends and that makes his loyalty to Lily even more respectable to me (not like having a crush and falling in love isn’t, but the friendship aspect of it feels much more powerful). Kept Me Hooked On: Full series re-read. WOW, I don’t know if I’ve EVER done a full series re-read from start to finish. I’ve meant to but I don’t think I ever made it all the way though. I’d pick up a book here and there or start in the middle, jump around… This was so great! Left Me Wanting More: Emotion. This book really, really gave me the feels, more so than any other Harry Potter book buuuuut I feel like there could have been JUST a touch more — time for the death scenes to really sink in, time for the romances to really blossom — and it would have totally wrecked my heart in a good way. Do it, friends. You won’t regret it. Especially if it’s been a long time since you’ve read the books! 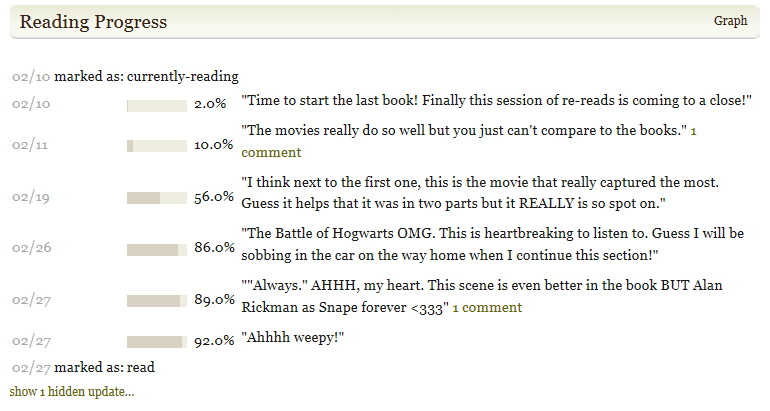 I watch the movies all the time but reading them (again) is a totally different experience. 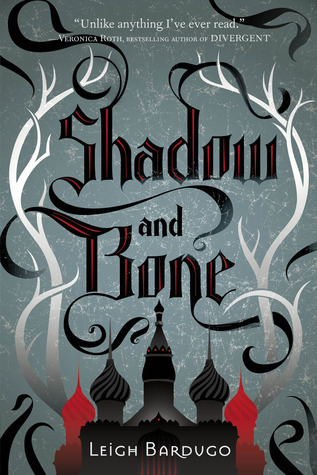 This entry was posted in Books, Fantasy, Review, YA and tagged Books, Deathy Hallows, Fantasy, Harry Potter, Harry Potter and the Deathly Hallows, J.K. Rowling, Magic, Review, Witches & Wizards, Wizards, YA, Young Adult on March 18, 2015 by Brittany. Publishing Info: July 16, 2005 by Scholastic Inc. So it's the home front that takes center stage in the multilayered sixth installment of the story of Harry Potter. Here are Hogwarts, Harry will search for the full and complex story of the boy who became Lord Voldemort — and thereby find what may be his only vulnerability. Lavender Brown // Character Obsessions: Frivolous things, Won-won, kissing, giggling. I kind of love Lavender Brown a little bit. She’s SO ridiculous but I really do like what she adds to the story. Without Ron & Lavender’s relationship, I don’t think Hermione’s jealousy would have escalated enough to FINALLY hit Ron over the head about their feelings for each other. Lavender was a little bit necessary for that so thank goodness for her, huh? Kept Me Hooked On: Felix Felicis. Can you imagine what a day would be like with Felix Felicis? I can only picture what one perfect day would be like… I loved that chapter when Harry took it! It was so interesting to see how things magically fell into place. Left Me Wanting More: Ron & Hermione. They are JUST STARTING to realize what they actually mean to each other. GO FORTH, KIDS. Go forth and love! Well, re-read if of course! 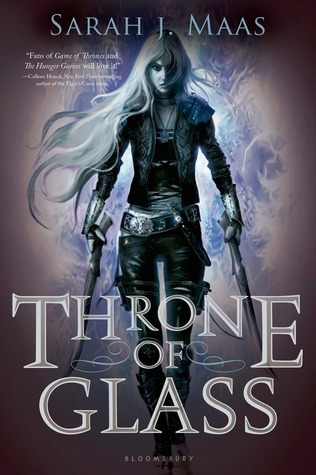 This is still one of my favorites and I still highly recommend re-reading this whole series. This entry was posted in Books, Fantasy, Review, YA and tagged Books, Fantasy, Harry Potter, Harry Potter and the Half-Blood Prince, J.K. Rowling, Magic, Review, Witches & Wizards, Wizards, YA, Young Adult on January 23, 2015 by Brittany. Today, Morgan from Gone With the Words is telling us all about one of her favorite Halloween movies (and one of mine too!) — HOCUS POCUS! I’ll let her take it away! First off, writing a blog post about something you love so much is HARD. I get it now! I just want to shout HOCUS POCUS. Sistahhhhs! Boooooook! And hope everyone understands me and nods along happily. Which most of you might, but just in case I will attempt professionalism of the fangirl variety. When I began thinking of a Halloween blog post to contribute to A Fortnight of Fright, my mind kept circling back to the Sanderson Sisters. If anyone asked me what the greatest Halloween movie of all time is, I would answer Hocus Pocus without hesitation. It’s not just because it’s one of my favorite movies in general — I’ll watch it in July, March, December, anytime, in addition to all of October. Heck, I’ve watched it twice in the same day before. It’s also because I’ve never met or talked to another person who doesn’t like Hocus Pocus! Seriously. I don’t even know what I’d do if I met someone who disliked it. It’s practically a requirement of our generation! The official Disney Fan Club, D23, even held a screening last year to celebrate the movie’s 20th anniversary! For those who haven’t seen it, Hocus Pocus is an American horror comedy from 1993 about a trio of witches, the Sanderson Sisters, who are inadvertently resurrected by a cynical teenager, his younger sister, and his crush. It’s the perfect blend of spookiness, sass, humor, magic, and Halloween spirit. There are cute boys, talking cats, evil witches, and a book made out of human skin. In other words, it has everything! The first time I saw Hocus Pocus was in a small local theater when I was 7 years old. I was with my parents and my little sister, and all I remember was thinking the movie was so scary! Haha!! The beginning is definitely creepy and seeing nooses and dangling feet isn’t exactly child-friendly. Nowadays, ABC Family and many other channels play it constantly throughout September and October. Even though I know I watched it a lot as a kid, it became a real favorite in college. I bought the dvd and watched it All. The. Time. Still do 😉 And this time of year not a day goes by where I don’t see someone (LOTS of someones!) mention Hocus Pocus on social media. I love it!! After all, if you don’t tweet about it, did it really happen? The best way to enjoy Hocus Pocus, in my opinion, is with friends, cozy sweaters, mugs of hot chocolate or tea and baked goods! Preferably Halloween funfetti cupcakes or something equally festive, with spice or caramel in the name. Or those Pillsbury sugar cookies with Halloween designs on them 🙂 But I’ve been known to watch it by myself ohhhh, all the time. I love the bewitching quality of the opening scene, and of Sarah Jessica Parker’s creepy song later in the movie. I love Thackery Binx, even though Thackery is a completely stupid name and I want to call him Zachary. I love that I was the same age as Dani when the movie came out. I love the three little girls dressed as the Sanderson Sisters. I love BOOOOOOOOK and I put a spell on you (Hello Salem!)…. I just love it all. The characters. The cute brother-sister relationship, and Max’s crush on Alison. I love Winifred’s statue too, wish they would add it to the Haunted Mansion grounds at Disneyland. Hocus Pocus was released in July 1993 and didn’t do particularly well at the box office but has become a beloved cult classic for good reason. It’s Halloween in movie form- I’m still looking for two friends to dress up as the Sanderson sisters with me someday! 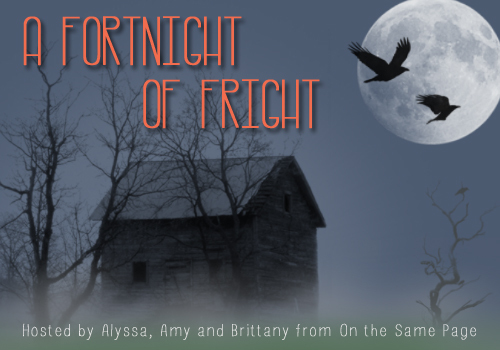 Thanks to On the Same Page for hosting A Fortnight of Fright, and thanks to Brittany for hosting my guest post on her blog! Let me know in the comments: have you seen Hocus Pocus? Do you watch it every year? What’s your favorite Halloween movie? This entry was posted in A Fortnight of Fright, Blog Event, Books and tagged A Fortnight of Fright, Halloween, Hocus Pocus, Horror, Movies, Paranormal, Witches & Wizards on October 20, 2014 by Brittany.